In the past I have not always agreed with the choices made at the IFTD New Product Showcase. If you’re not familiar with it, the showcase is where manufacturers display their new products and the media vote on which products for the coming year are best. In fairness, voting on products that you haven’t had the chance to try on the river is not easy and there is a lot of, well…guessing involved. I do it myself, and I try to make it an educated guess, but it’s still a guess. Some products are easy to get your head around. It’s fairly simple to decide if you like a fly box or fishing pack but a fly rod can be tougher. It’s hard to know how a rod will fish just by giving it a wiggle. If you think rods are tough, how about a fly line? Choices are often based, unconsciously, on a company’s marketing and public relations. Those products get press and you end up buying them for better or worse. In my experience the odds of the right products getting the nod are at best 50/50. This year I actually have some real experience with a few of these products and I’m happy to report that the New Product Showcase awards got it right. Bruce Chard is a good friend of mine so I got this line in my hands really early. I’ve had the chance to fish it thoroughly and in my opinion it’s the best fly line I have ever used. Every saltwater angler should own one. I’ll not go into all the reasons I love this line but you can read my full review (HERE) and you can click (HERE) to buy one from Bruce. My hat is off to Scott. The Radian is brilliantly designed and flawlessly executed. A powerful fast action rod with all the feel of a slower action. No dead spots. No compromise. Coincidently, the last time I agreed with the best rod award was several years ago when the Scott S4s was chosen. Maybe that tells me something. You can check out the Radian (HERE) We will have a full review soon. There were a lot of other great products in the showcase. Some things I really liked were passed over and some others chosen. There is a lot of innovative gear coming our way in 2014. You will see a lot of it in our Friday gear videos over the next few months. 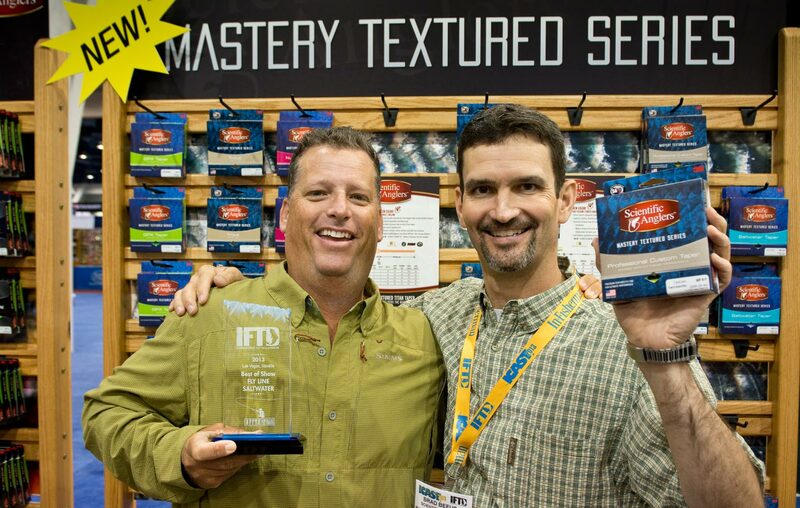 This entry was posted in Fly Fishing Gear and tagged fishing, Fly Fishing, fly fishing lessons, Fly Fishing Photography, Gink and Gasoline, how to fly fish, IFTD awards 2013, Kent Klewein, learn to fly fish, Louis Cahill, photography, RIO Perception fly line, Scott Radian fly rod, The Scientific Anglers Bruce Chard's Grand Slam fly line by Louis Cahill. Bookmark the permalink. Scott & Rio got it right! Have the 5wt radian & perception line. It is “as advertised”!! !